Security is a rapidly growing area of computer science, with direct and increasing relevance to real life applications such as Internet transactions, electronic commerce, information protection, network and systems integrity, etc. 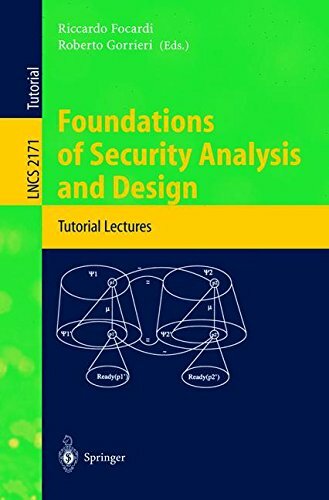 This volume presents thoroughly revised versions of lectures given by leading security researchers during the IFIP WG 1.7 International School on Foundations of Security Analysis and Design, FOSAD 2000, held in Bertinoro, Italy in September. Mathematical Models of Computer Security (Peter Y.A. Ryan); The Logic of Authentication Protocols (Paul Syversen and Iliano Cervesato); Access Control: Policies, Models, and Mechanisms (Pierangela Samarati and Sabrina de Capitani di Vimercati); Security Goals: Packet Trajectories and Strand Spaces (Joshua D. Guttman); Notes on Nominal Calculi for Security and Mobility (Andrew D. Gordon); Classification of Security Properties (Riccardo Focardi and Roberto Gorrieri).